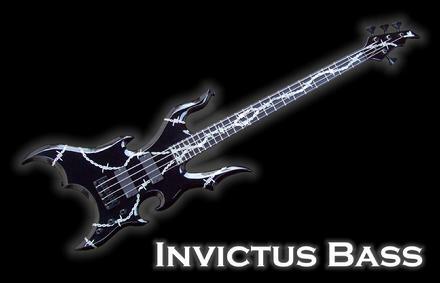 11-20-10 - Invictus Bass #2 has been completed. High Gloss Black with Barb Wire graphics and inlays! 11-17-10 - New videos of Smouldering in Forgotten live in Dubai - Oct. 31th 2010. Tracks are - An End To All Things, Crimson The Sands and Ash, and Tallow. 11-11-10 - Monson Guitars is proud to announce it's new collaboration - endorsement with the mighty IMPIETY - Asia's most extreme blackened war metal regiment. 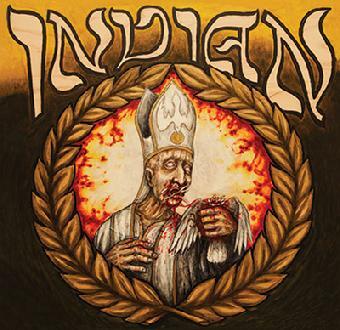 IMPIETY releases their 7th album "Worshippers of the Seventh Tyranny" on Agonia Records this Jan. 24th 2011. They will be headlining the RITES OF DARKNESS II Festival in San Antonio, TX this Dec 11th, their first ever US appearance - more to come! 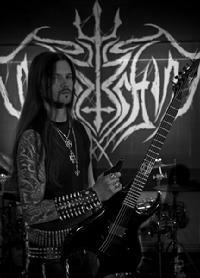 Stay tuned to see what Monson has created for Shyaithan (frontbeast, bass.guitar.vocals) in the coming weeks! 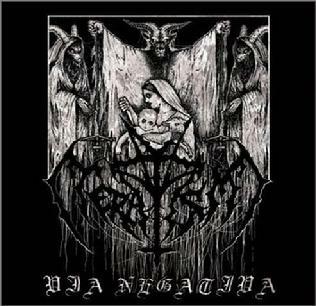 10-27-10 - Teratism's latest CD "Via Negativa" is out now on Negativity Records! 10-27-10 - Redemption #3 is out of the shop! 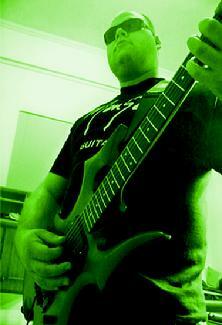 10-14-10 - It's been a long time in the works, but I'm very happy to announce the new Monson Guitar artist Ophiolatry. 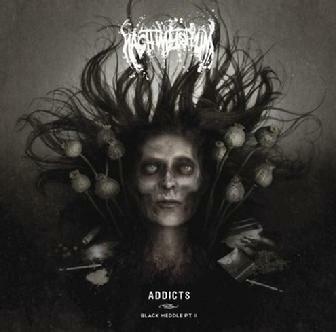 They are a death metal band out of Brazil. Fabio Zperandio has his new Monson Pulveriser. You can check them out here www.myspace.com/ophiolatry and their supreme CD "Transmutation" is out on Forces of Satan Records and distributed with Regain Records! 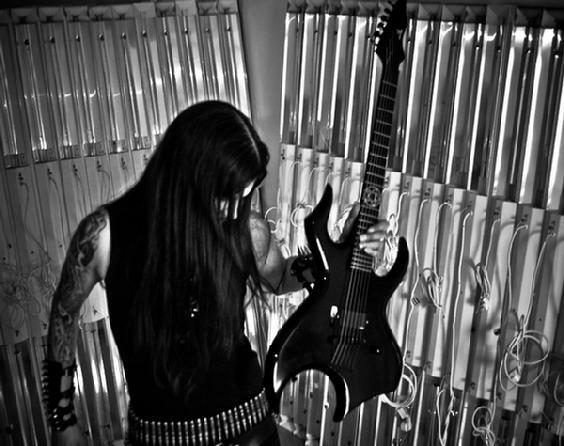 Fabio Zperandio of Ophiolatry w/ his Pulveriser! 9-15-10 - Latest Varikill out of the shop! 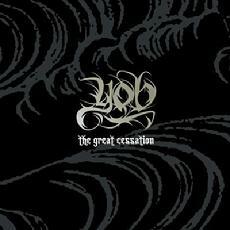 8-31-10 - Monson Guitars is extremely proud to anounce the new endorsement of YOB! 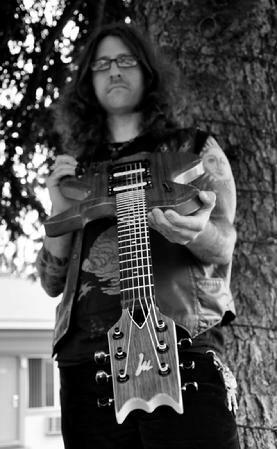 YOB is based out of Eugene, OR and I've had the pleasure of working with guitarist Mike to create his new guitar, The Nomad. You can also check out their latest CD, "The Great Cessation" out now on Profound Lore Records and also available on vinyl with bonus tracks from Southern Lord. 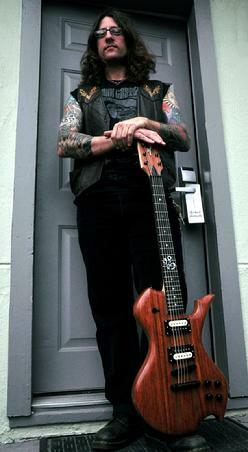 8-23-10 - Nate of U.S. Christmas does video demo w/ his Monson Guitars. 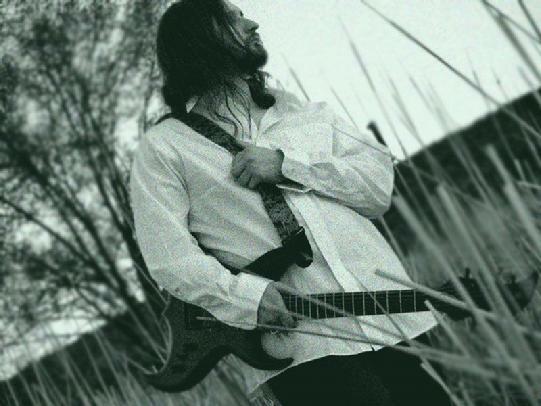 8-19-10 - Monson Guitars artist Nate Hall of US Christmas is set to release their highly anticipated and amazing new album "Run Thick in the Night" on Neurot Records any day now. <?xml:namespace prefix = st1 ns = "urn:schemas-microsoft-com:office:smarttags" />"U.S. CHRISTMAS is a band from the Appalachian mountains in western North Carolina and eastern Tennessee. The band plays a unique brand of psychedelic, high-volume blues rock that evades any easy classification. Founded in Marion NC in the summer of 2002, the band played rough biker bars, art spaces, and house shows all over the southeast dirt circuit for years, self-releasing albums in rough cd-r form. 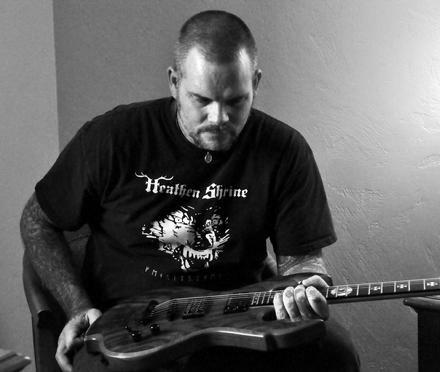 Scott Kelly of Neurosis heard the band�s third record, Salt The Wound (which was released in Russia by the label RAIG), through his radio show Combat Music Radio/KMBT, which lead to the release of the band�s fourth album Eat The Low Dogs on Neurot Recordings. 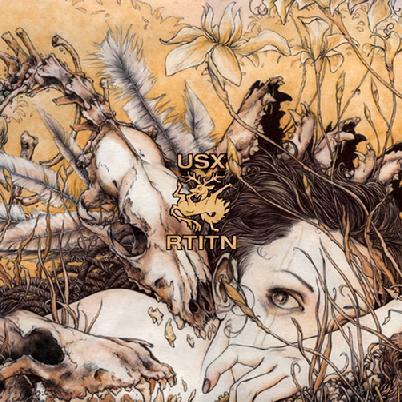 USX now approaches a decade of playing, recording, and evolving, and continues to blur the boundaries of heavy music with earsplitting rock that is by turns jangly, crushing, and dark. The band has often been associated with space rock, and German Rolling Stone even included the band in an article/compilation cd on the history of that genre. 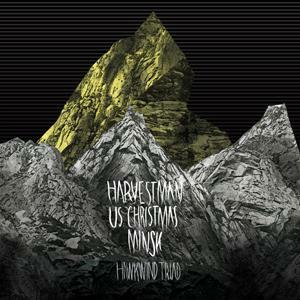 However, USX are not simply continuing the space rock tradition (although USX, Minsk, and Harvestman recently recorded a tribute to the British space-searchers Hawkwind), but are rather a group of musicians who pay attention to a wide variety of music from all eras and origins. Close attention to the band�s lyrical content will show that USX is not at all concerned with outer space, but rather focuses on themes of earth, nature, and terrestrial human history. In fact, the mountains and people of western North Carolina are a primary influence on the band�s sound. And though many have focused on the band�s use of vintage synthesizers and theremin, the band does not rely on any one instrument to create its bizarre sounds � proof that brains and hands are a musician�s most important tools." 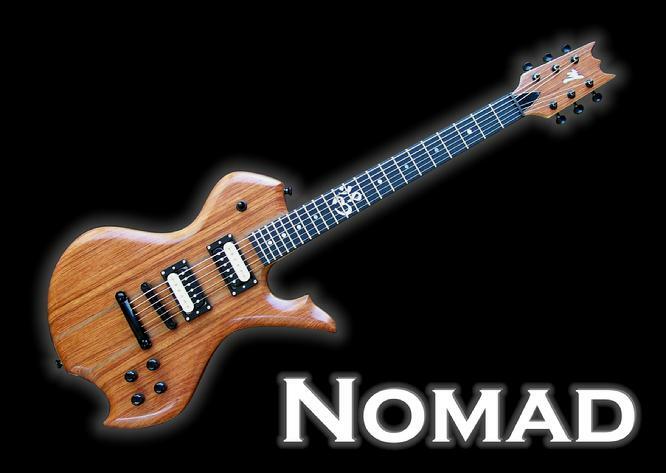 8-16-10 - Monson Guitars is pleased to introduce the newest design.....The Nomad. 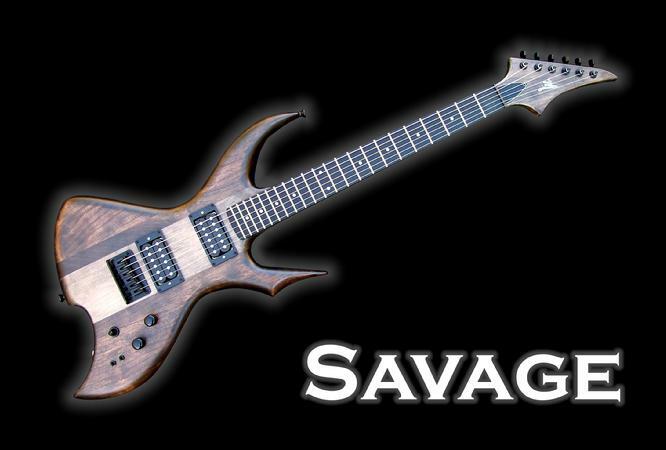 Natural Satin finish, Bubinga top, Om symbol inlay, BareKnuckle Pickups. Some endorsement news is soon to follow. 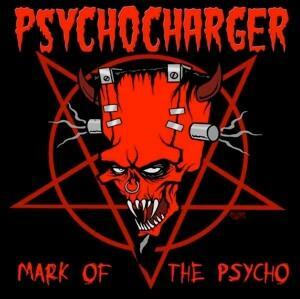 8-4-10 - Monson Guitar artist Jimmy Psycho of Psycho Charger has released their 2nd CD....Mark of the Psycho. 8-4-10 - Monson Guitar artist Rogga of Paganizer has released 2nd Revolting CD....Dreadful Pleasures.....via Razorback Records. 7-29-10 - While virtually everyone is busy making an extended range guitar that has more octaves than the last guy, I have absolutely no problem doing a 180 and going in the other direction. 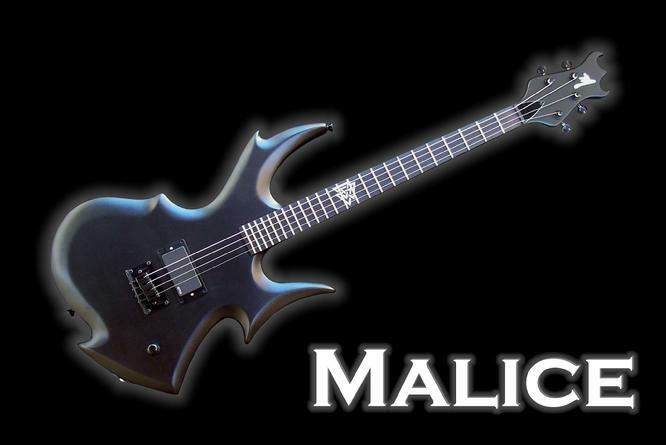 Introducing the Malice 4-string guitar.....for when those extra 2 strings are just getting in the way of true sonic devastation. Less is more. 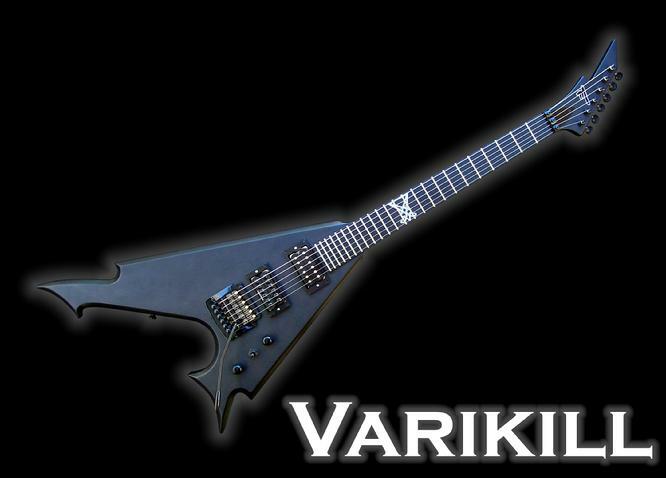 This is for Monson Guitar artist Ynleborgaz of Angantyr. 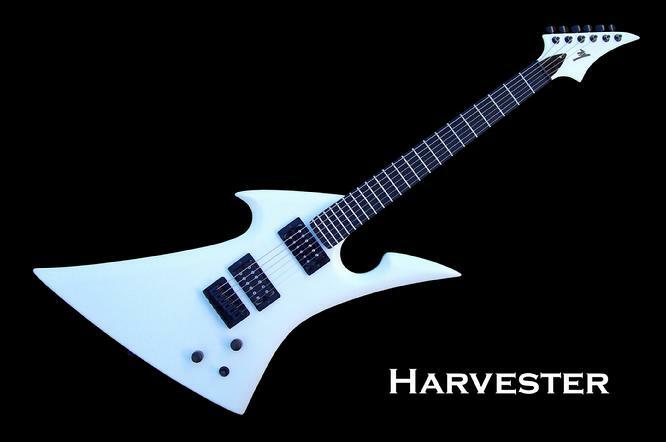 Of course, it's still available in a 6-string. 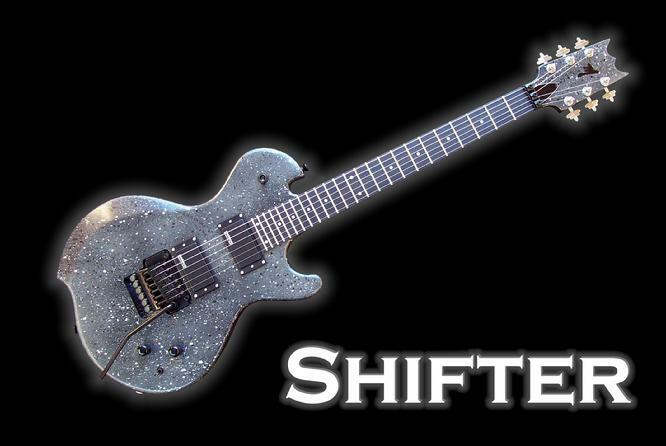 7-29-10 - Monson Guitars introduces it's newest design.....The Shifter. Very simplistic for Monson Guitars, but also a unique twist on a classic shape. It feature a new paint job simply called "Granite". A new endorsement announcement about the owner of this guitar will follow shortly. 6-25-10 - Pulveriser #4 featuring gas mask & radiation symbol inlays. 6-7-10 - New Crimson Ghosts video for "Unleashed" off the new cd "Generation Gore" coming soon on Contra Light Records. 5-20-10 - Neurot Records has released the Hawkwind Triad CD, featuring USX, Minsk, and Harvestman. Check it out....... http://www.neurotrecordings.com/detail.aspx?ID=200 . 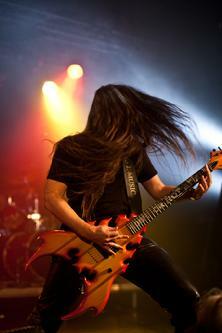 5-6-10 - I'm very pleased to announce a new endorsement with the band Withershin from Sweden. 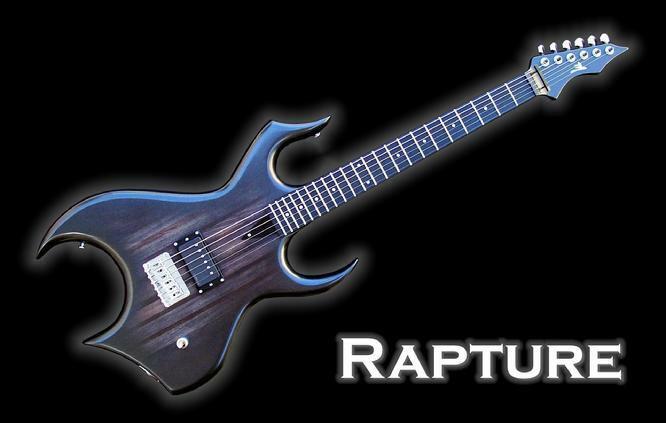 Hizon will be playing his new Rapture guitar. Check them out! Hizon of Withershin w/ his Rapture! 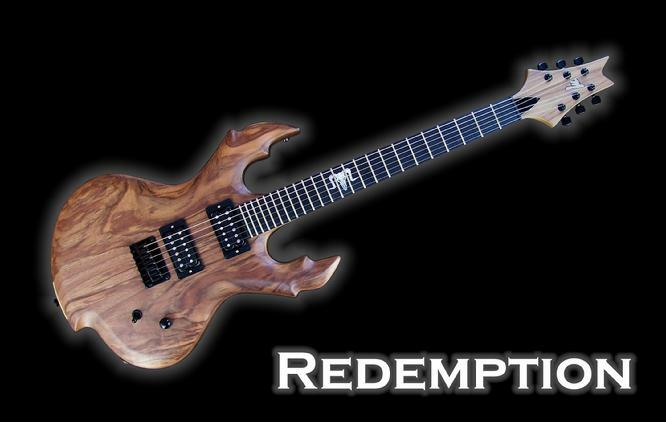 4-20-10 - The latest Redemption guitar in stock now! 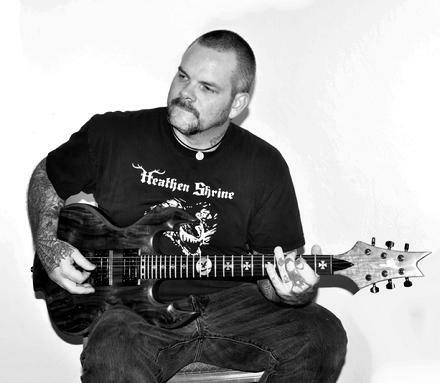 3-13-10 - Monson Guitars artist Smouldering in Forgotten featured on CNN. Nice to see someone getting the attention they deserve! 3-12-10 - Introducing the V.I.O.D. 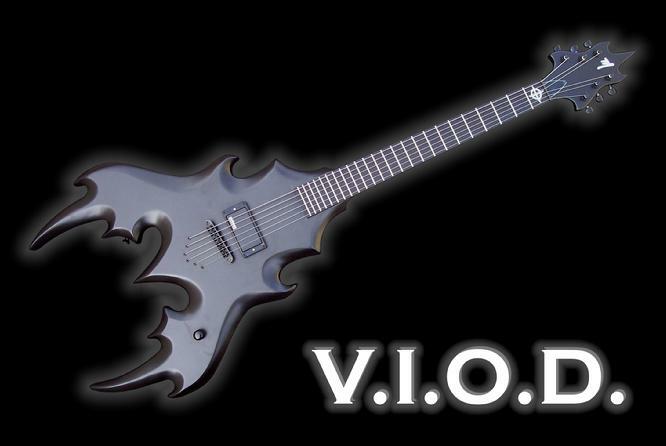 - Violator / Instrument of Doom. Designed to be something of a cross between the Monson Virus and Vigilante. Built for Toby of TX with a "Sons of the Zodiac" inlay at the 1st fret. 2-28-10 - Smouldering in Forgotten announce that they are releasing their second full length album �I, Devourer� digitally through CD Baby (Amazon Music, iTunes, Napster...etc.) on the 1st of March. �I, Devourer� is an extremely aggressive and atmospheric album that incorporates elements of death metal and thrash. 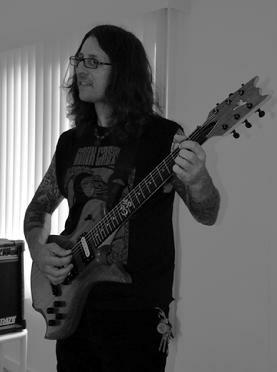 The album was mixed and mastered by Brian Elliot from Mana Recording Studios (Cannibal Corpse, Goatwhore) and the results are phenomenal. Check it out! 2-8-10 - First, introducing the new Coyote. 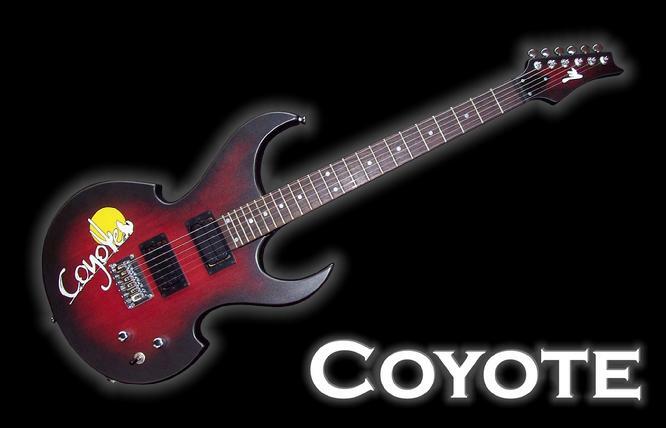 This is a promotional display guitar built for the new Coyote Clothing Co. opening in nearby Oroville, CA. 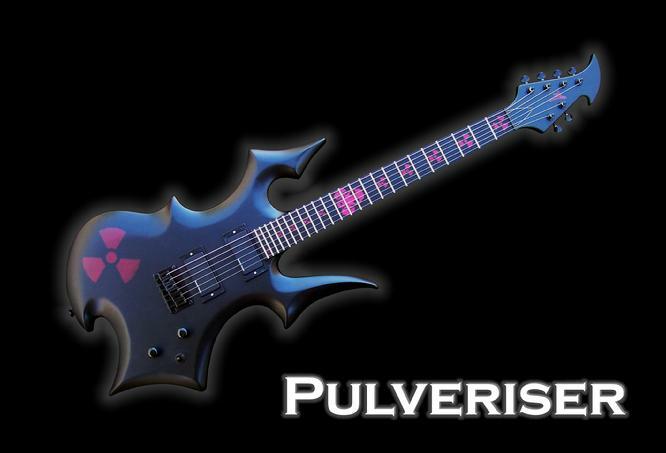 Second, the latest.....Pulveriser #3 and Rapture #3. Both have new endorsement announcements following them soon. 1-2-10 - To celebrate 9 years of Monson Guitars and the fact that I'm alive, kicking, and still building guitars......2 new axes. 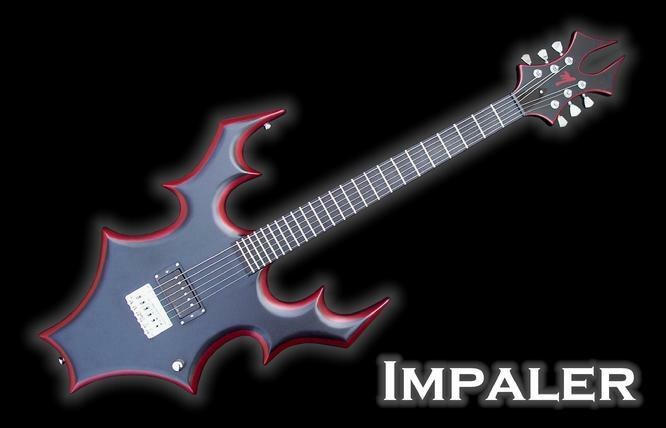 First, I have redesigned and built a new updated version of 'The Impaler'......the first guitar I ever made back in January of 2001. 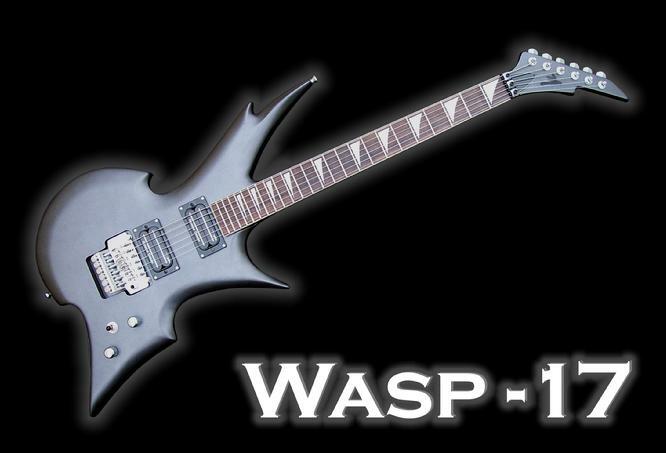 Second, as a symbol of the future for Monson Guitars........the 'WASP-17'. Thanks to all the Monson Guitar fans and your support! 10-25-09 - I'm pleased to announce the new endorsement of Scott Kelly. 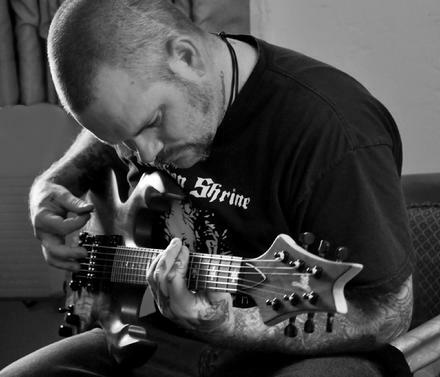 Scott is known for his work with Neurosis, who should need no introduction, but also for his work with Blood & Time and his solo work. Scott's current project is with Shrinebuilder. Shrinebuilder includes other veteran musicians Wino, Al Cisneros, and Dale Crover. The new Shrinebuilder release is out Oct. 27th via Neurot Records followed by a string of live dates. 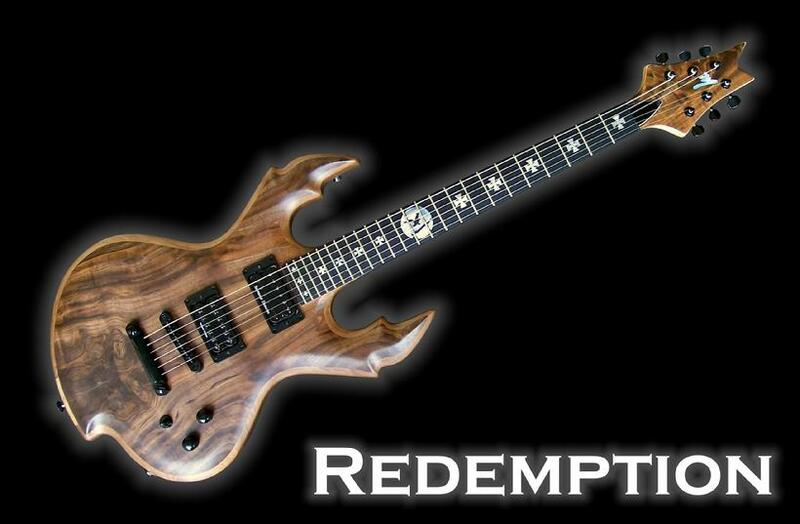 Scott and I worked together on the new Redemption guitar. The results are stunning. I'm happy to be working with someone who's been around as long as he has and who's musical work speaks for itself. Be sure to check out Scott's weekly radio show on www.combatmusicradio.com . Check the Shrinebuilder page for current live dates. 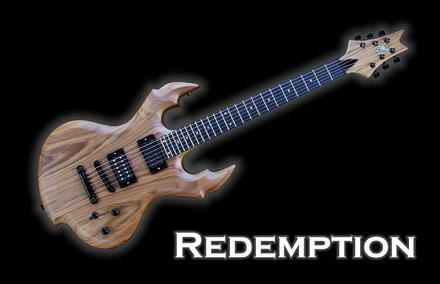 10-20-09 - Redemption is here! 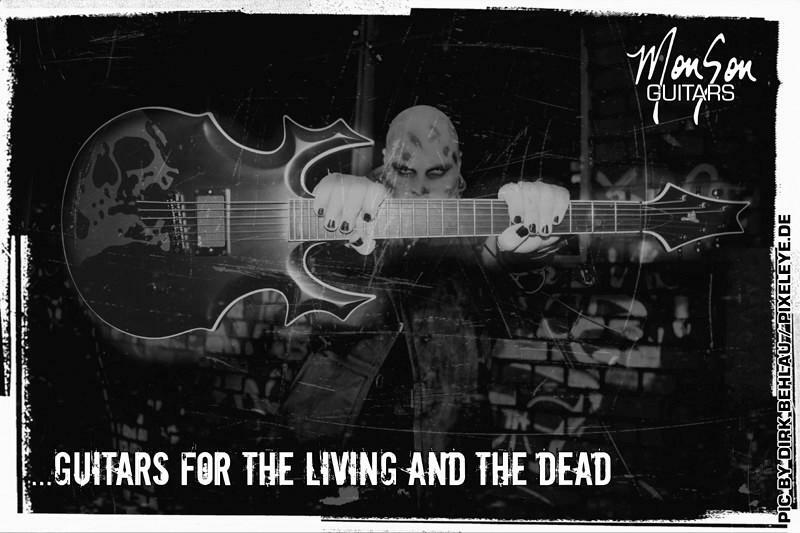 An announcement about who this beautiful guitar was built for is coming next week! ....and another one here...... http://issuu.com/shuffle/docs/shuffle6 .....page 6. 9-16-09 - Watch for the new CD from Smouldering in Forgotten - "I, Devourer" coming soon. As well, the new CD from Megalomania999 - "Rebirth" is out now! Here are some pics from the CD release party! 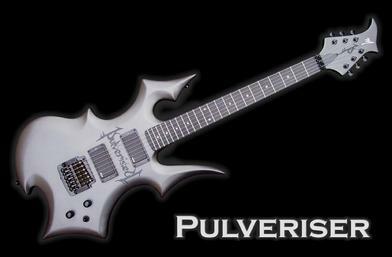 9-11-09 - Here it is.....the Pulveriser for the Metal Messiah Radio guitar giveaway contest! 9-7-09 - Rapture #2 for Nate of U.S. Christmas is completed. 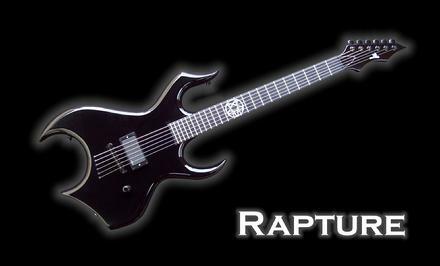 Nate is hitting the studio with his Rapture guitar(s) soon, so expect great things from them soon! 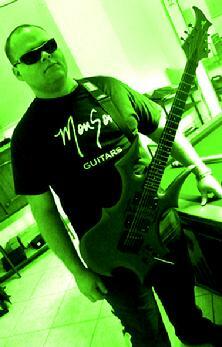 7-10-09 - Monson Guitars is proud to announce the endorsement of U.S. Christmas! 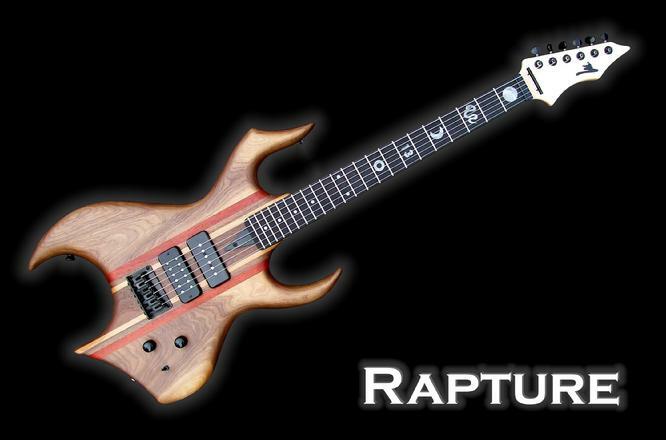 Nate has the new Rapture guitar and I'm very happy to be cooperating with him. If you haven't heard the latest USX cd "Eat the Low Dogs", out on Neurot Records, do yourself a favor and pick it up! The spirit of sound is alive! Nate of USX with the Rapture! 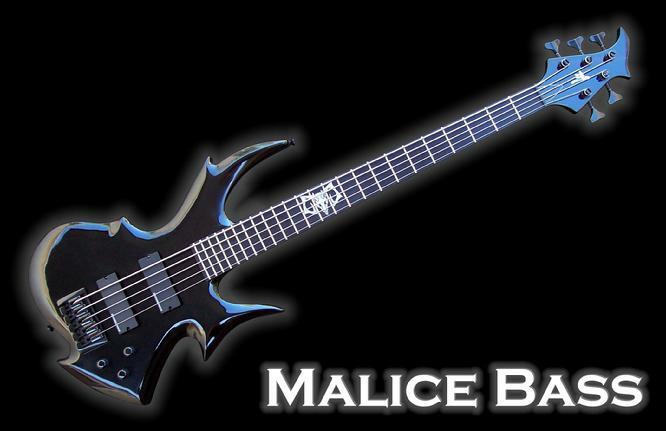 7-8-09 - New design MALICE is unveiled! 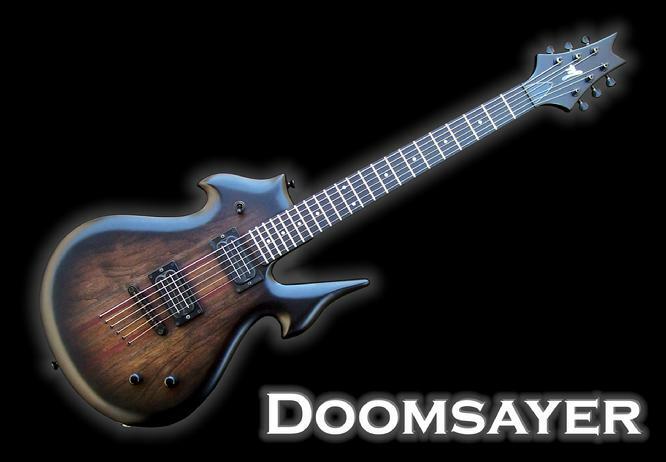 One of the deadliest basses you're likely to ever see. This one is Stefan's! 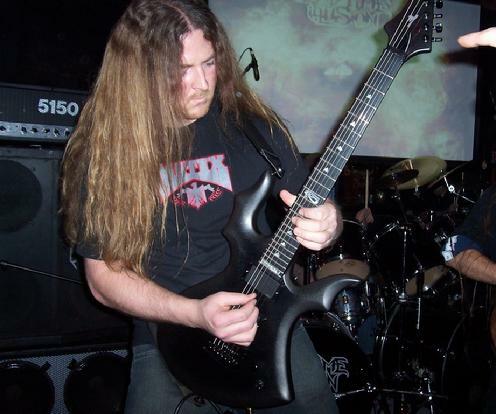 6-18-09 - Monson guitars is teaming up with Metal Messiah Radio for a contest raffle promotion! 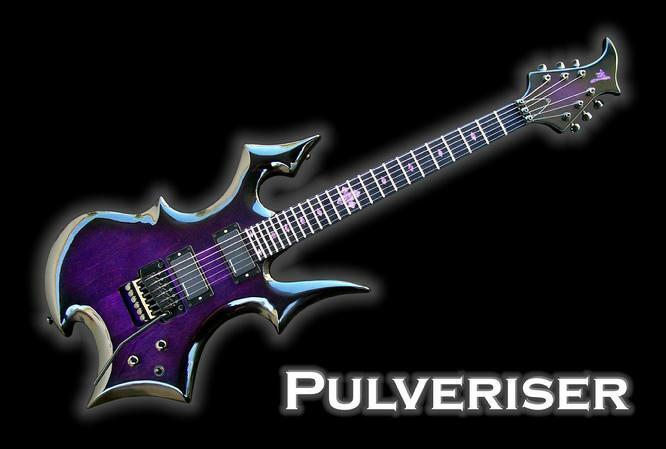 I'm going to be building a custom Pulveriser guitar with some killer specs to be given away in Dec. '09 with Metal Messiah Radio. Raffle entries will be $1...stay tuned for all the details on how to win! 5-31-09 - Doomsayer #2 completed. This guitar is available now! Check the in stock page for more details. 5-23-09 - New design RAPTURE is introduced! This guitar is available now. Check the in stock page for more details. 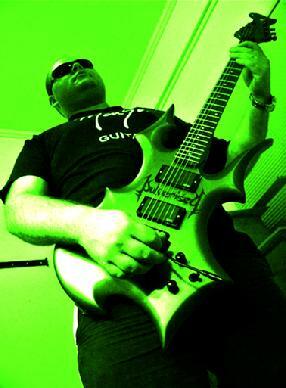 5-17-09 - I am pleased to announce the endorsement of ENVINITY . 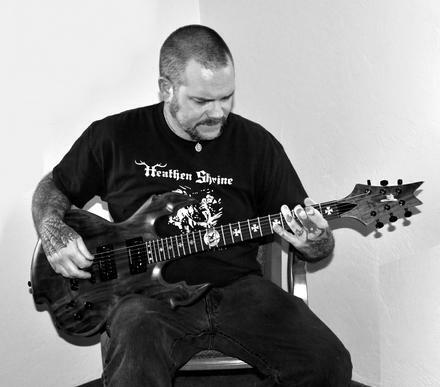 They are based out of Colorado and guitarist John has a beautiful Witch model. It has been some time coming, but we finally got everything finalized! 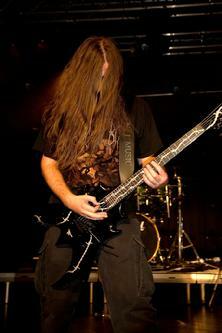 Envinity is currently putting the finishing touches on their 3rd full length CD. 3-26-09 -- This is an older design that has recently been reworked......introducing the new Demon. For Domitian of Teratism. 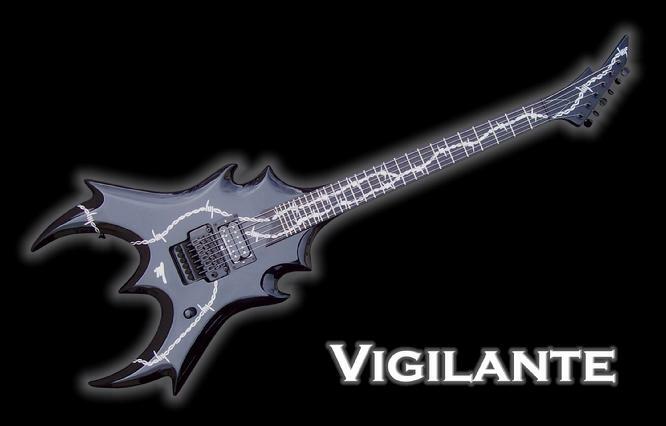 3-4-09 -- I have been working on the Vigilante for some time now.....it is finally completed. 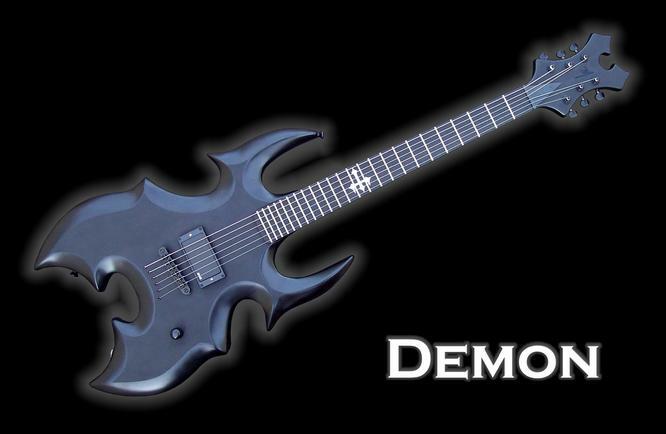 Yes, if you're counting, that has 27 frets w/ the barb wire inlay and graphics. 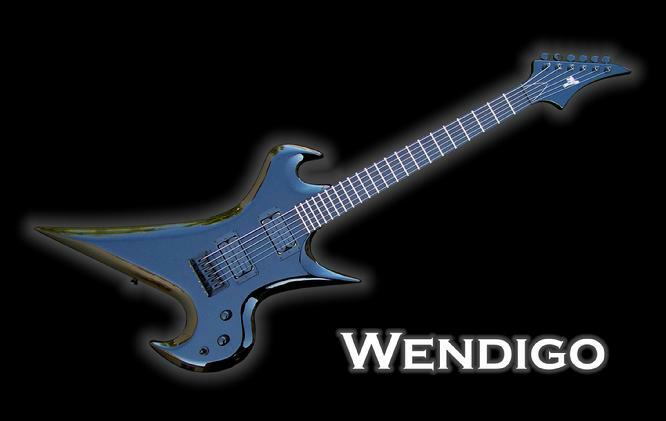 2-12-09 -- Monson Guitars is proud to announce the endorsement of END-TIME ILLUSION ! 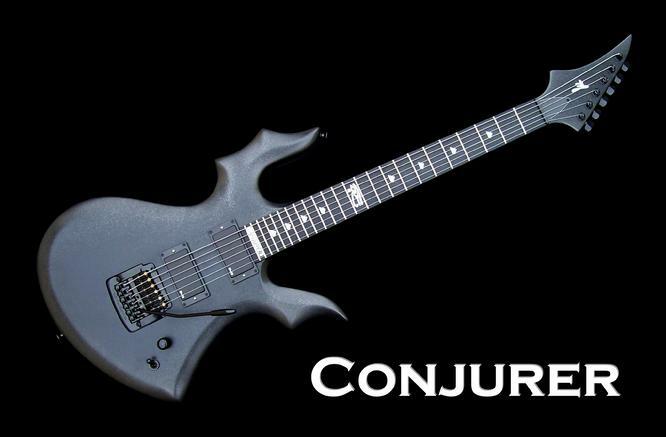 Guitarist Dave has the new Conjurer guitar. 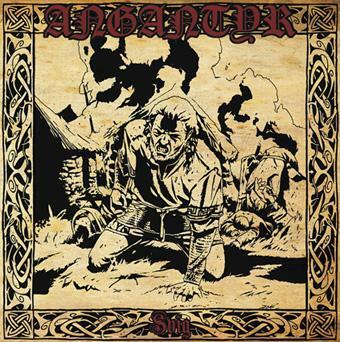 Their CD "Eminent Profane" is out on Spare Change Records. 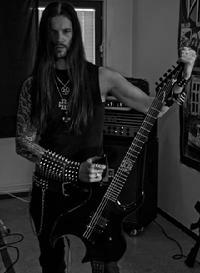 Dave of End-Time Illusion w/ the Conjurer! 1-22-09 -- The new Conjurer is unveiled! 1-14-09 -- The newly completed Harvester prototype is unveiled! 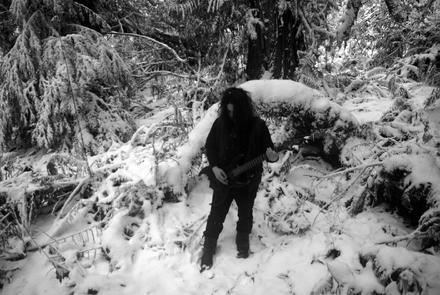 12-19-08 -- Monson Guitars announce the endorsement of Wolves in the Throne Room! 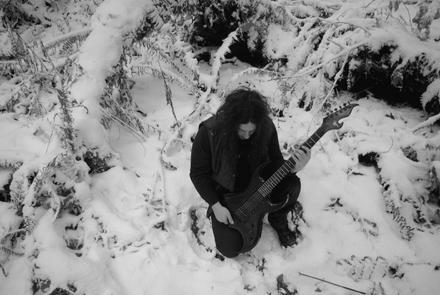 I have been a fan of Wolves in the Throne Room for years now, so it is an honor to be working with them. 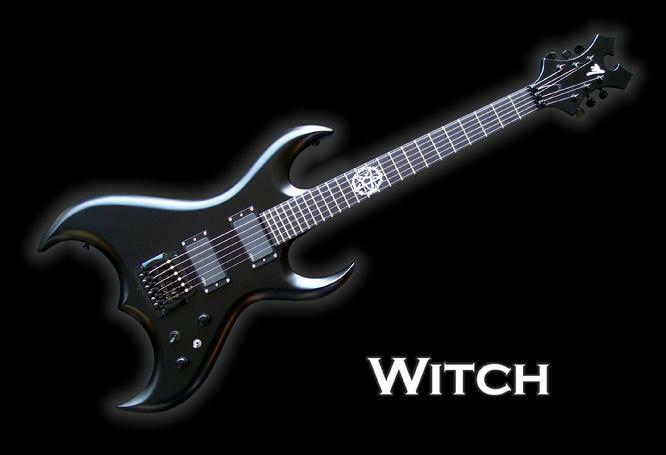 Nathan has a Witch model guitar and Will has the new Doomsayer guitar. They've been busy in the studio recording their third full length CD coming out on Southern Lord Records. Keep an eye out for their new EP as well. 12-17-08 -- New promo picture with Jackal of the Crimson Ghosts and the Jackal! !